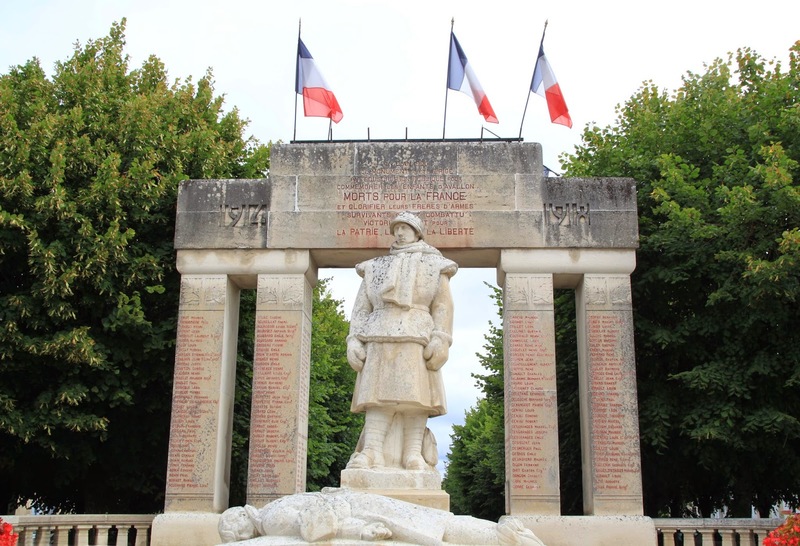 Driving through Burgundy recently, I start to notice a pattern: a memorial in virtually every town to those who fought, and fell, in World War I. This brings me to Armistice Day, observed today -- and not just any Armistice Day but one marking the centennial of the beginning of World War I (1914). Listening through my window to the cacophony of church bells, you'd know today was something significant. Many of the towns' memorials are in front of the church, which is generally located in the center of the village. Sometimes, the monuments are placed right outside the town cemetery, as in Lichères-sur-Yonnes. It's a logical spot that places the soldiers' tombstone-of-sorts besides those of their family members. 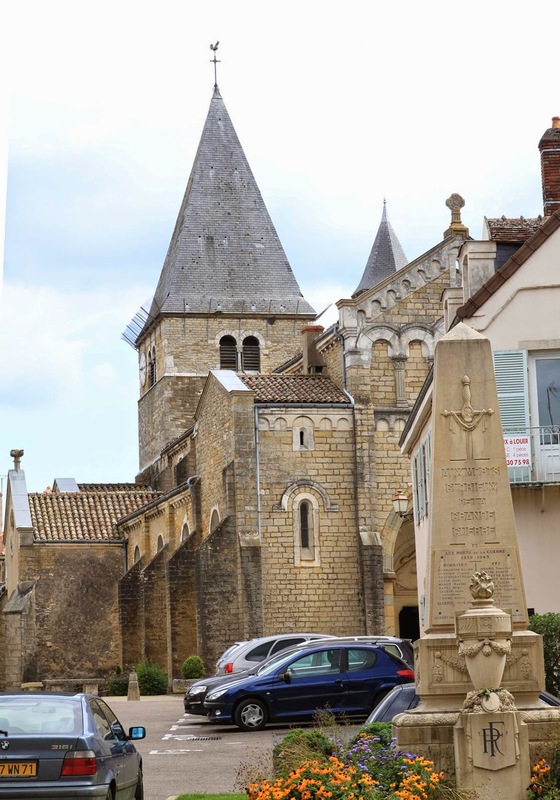 In teeny, tiny Savigny-en-Terre-Plaine, the memorial is all of the above: in the center of town, just in front of the church, right outside the cemetery. It's such a small village, I would be surprised if there are that many young men living here at the moment. You're pretty much looking at most of it: a church, a few dozen houses, and a few farms before you hit the next village's border. How on earth could so many from just this one spot have fought and died? It boggles the mind and breaks the heart. Driving along, I look down over this little village and think to myself, "I'll take a photo of this to show the size of these villages, with their memorials for 10, 20, 30 people. That will put some scope to it. I'll say how virtually every town, just like this, has a World War I memorial." 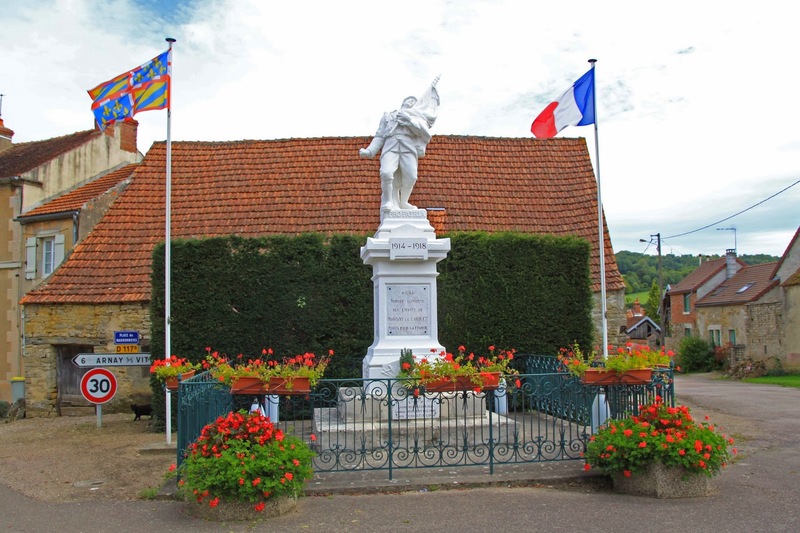 Then, as it happens, the road I'm on veers down the hill and through the village itself, Marigny-le-Cahouet, and I see this, the town's World War I memorial. It turns out it's not a typical pyramid pillar. Such a small town. Such a big monument with so many names. ...as does Avallon, also a bigger town. Not only is Avallon's list -- in blood red -- depressingly long (it wraps around some of those columns), you can see how many brothers (or fathers and sons) of Avallon all perished in the same war. Autun, a town that prides itself on ancient Roman ruins, has taken an unexpectedly modern route for their memorial. I'm genuinely not sure how the small town had this many citizens of fighting age, even if the names listed are from various wars. 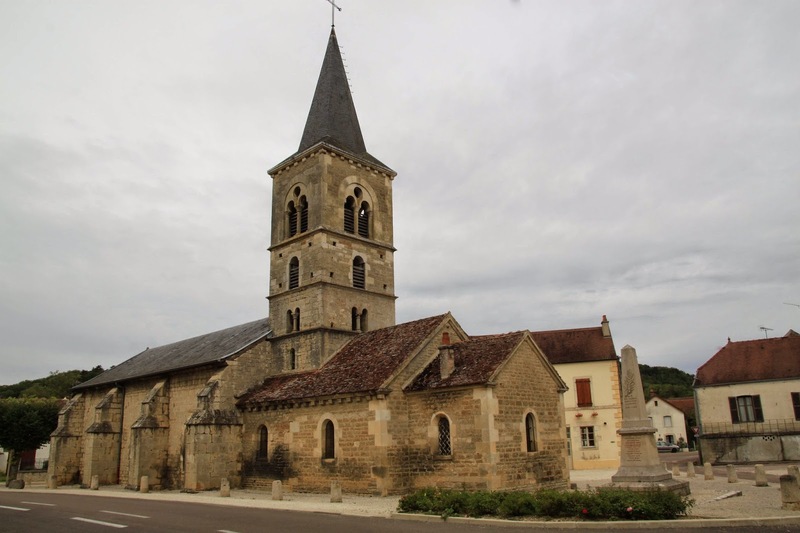 Here, in the town of Noyers-sur-Sereign, a plaque inside the church is dedicated to American World War I soldiers. It's the sheer numbers of these memorials that gets to me. One village after another after another. Name after name after name. They just keep driving the point home: such monumental losses, so many buried sons, so tragic. 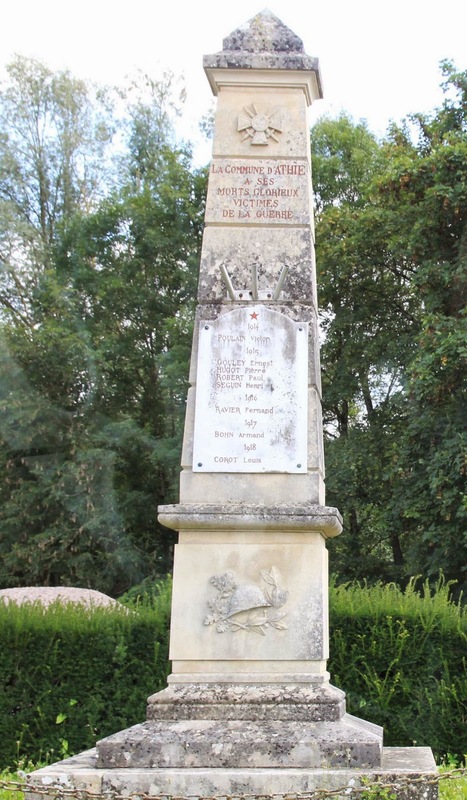 Of course, Frenchmen (and women) from all over the country would have fought and served during that war, but since the battle lines were so close to Burgundy, it seems like there's an extra-high concentration of memorials here. Yet in Alsace, in the tiny village of Riquewihr, and even closer to the front lines, I come across this angel, dedicating two tablets to name after name of the local fallen. Many of the memorials, which are mainly World War I focused, do add on names from other wars, in particular World War II. Perhaps not surprisingly, given the location right next to the German border, Riquewihr was hit hard in both wars. The addendum for World War II on this memorial is especially interesting. Not only does it mention the victims of war from 1939-1945, there is an additional, more modern plaque attached at the bottom that reads (in translation): "In honor of our comrades, victims of incorporation by force into the German army from 1942-1945. 105 French citizens of Riquewihr were forced to wear the uniform of the enemy army; 28 among them died for an ideology that they all rejected. We will never forget them!" Though I realize I could be cynical, I choose to accept this at face value and feel just as sad for them as for the soldiers fighting with the Allies. In Paris, right next to the Grand and Petit Palais, there's a temporary, outdoor photography exhibit: 100 photos for the centennial of World War I (counting from its starting battles in 1914). Seven and a half million French men were mobilized for World War I. The Senegalese soldier on the right is one of 200,000 African soldiers, 31,000 of whom would not return, alive, to their own continent. There are photos showing the non-combatants affected, like Denise Cartier, a nine year old girl who lost her leg after being struck by German mortar. And this nurse, in a photo from 1917, who represents many of the women who also worked toward the war effort. I have to say, it is both very dated -- and very French -- that she is lighting up a cigarette for the patient. The pictures cover the famous, to the common. On the left, Roland Garros, not a tennis player but rather an aviator and fighter pilot shot down in 1915 (experimenting with shooting a machine gun through the propeller). He escaped after three years in captivity and returned to active duty before being shot down in a battle over Charleville in 1919, at the age of 25. The photo on the right below shows soldiers using a fire hose to wash each other. That sounds more fun than fighting. Not too far away in Paris is a permanent World War I memorial, by artist Armand Martial, dedicated to Albert 1er Prince of Belgium, near the Place de la Concorde (here, seen through a bus window, if you're wondering about the photo quality). 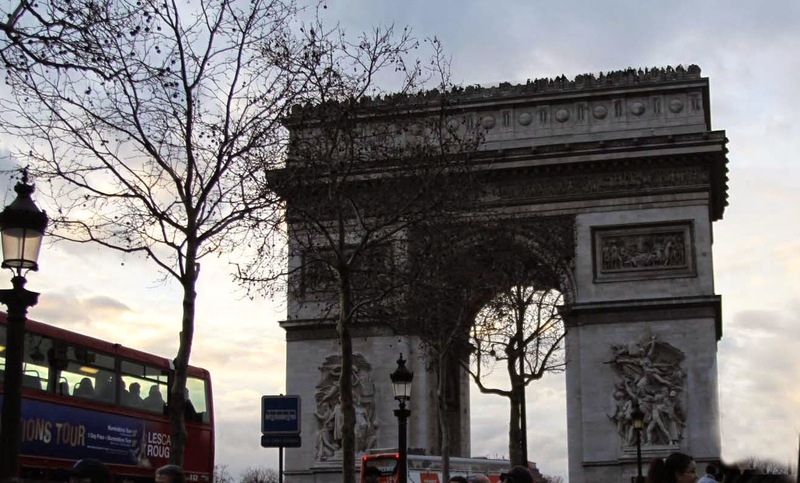 The most famous war monument in Paris has to be the Arc de Triomphe, though it is not World War I specific, having been built between 1806 and 1836 under Napoleon's orders. But it does have an eternal flame lit in honor of the unknown World War I soldier. 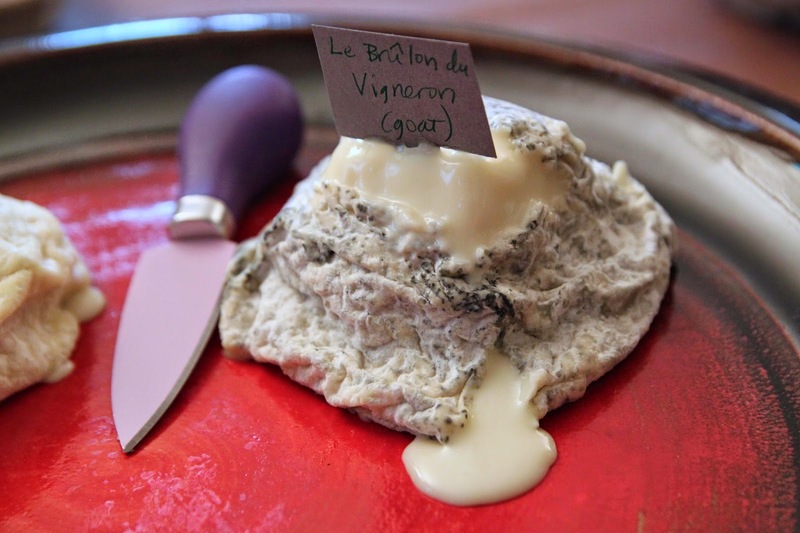 Le Brûlon de Vigneron is a raw goats' milk cheese from Saligny, on the edge of Burgundy closest to Paris. It's a farmhouse cheese, unusual and hard to find outside the region. The cheese starts out a somewhat solid, thick, creamy little square pyramid of a cheese. As it ages, and warms, it turns into an buttery, weeping little mound. It's delicious both ways, but of the two, I prefer it wet and oozing. It's a mild cheese, heavily buttery in flavor with a healthy dose of delicious goat tang. A "vigneron" is a winemaker, but in this case the "brûlon" doesn't refer to the department of the same name on the other side of France, but rather is derived from the word "brûler", meaning "to burn". "Le brûlon" in turn can mean something akin to the "smell of burning" or even "burned char", which is a natural thing to have around a winery, since historically the fields were burned at various times as part of the grape growing process. This cheese has no burned smell, though it does have a wonderfully earthy feel and taste to it. I think the name has more to do with the look: the slightly blackened, ashed crust. While this cheese, specifically, is a more modern creation, historically goat cheeses like this would actually have been coated with grape-vine ash as part of the cheese-making process, thereby tying together the wine, the cheese, and the terroir. Not only do I buy the Brûlon de Vigneron in Burgundy, where I see this incredible, heartbreaking concentration of war memorials, but also I'm reminded of the memorials by the look of the cheese itself: It has that four-sided pyramid shape of the top of the ubiquitous memorials, and also a stony color and texture. When it ages and warms up, the cheese weeps, which is pretty much what I want to do when I see this seemingly endless parade of names and memorial statues.